Walkers are being invited to follow in the footsteps of Lakeland’s most venerated chronicler of the fells – in the Yorkshire Dales. Alfred Wainwright devised his Coast to Coast Walk from the Irish Sea to the North Sea in 1972 and since his book of the walk was published, thousands of foot-weary travellers have traversed the high ground of England in the 309km (192-mile) quest to walk across the country. Now, the whole length will be walked to celebrate the 60th anniversary of the legislation that led to the formation of the three national parks the route covers; the 75th anniversary of the Friends of the Lake District; and the 40th anniversary of the Cleveland Way, which shares paths with Wainwright’s walk in its latter stages. The walk will also mark the formation of the coastal branch of the North Yorkshire section of the Campaign to Protect Rural England. The Coast to Coast Walk enters the Yorkshire Dales national park at Nine Standards Rigg above Kirkby Stephen, and walkers are being invited to cover one of three legs taking place as it crosses the park. James Lamb, the Yorkshire Dales National Park Authority area ranger for Swaledale, will undertake the final stretch, between Reeth and Richmond. Jon Avison, the authority’s head of park management, said: “The National Parks and Access to the Countryside Act was passed in 1949 and paved the way for the creation of today’s family of 14 UK national parks, 49 areas of outstanding natural beauty, 294 national nature reserves and 2,900 miles of national trails. The full walk has been broken down into fifteen legs starting at St Bees Head and passing through the Lake District, the Yorkshire Dales, and the North York Moors national parks before ending at Robin Hoods Bay. Individual stages vary between 14½km (9 miles) 27km (17 miles). Alternatively, groups and individuals can share the total distance walking their section of the walk over the two week period thus completing the whole route as a ‘team’ in the two week period. grough walked the Coast to Coast a couple of years ago. You can read our account of the experience. 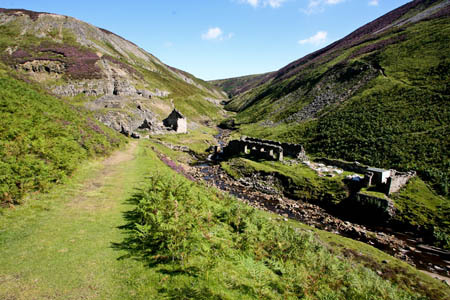 The Yorkshire Dales section of the commemoration of the walk starts on 21 September with the Kirkby Stephen to Keld trog over Nine Standards Rigg and Witsundale, with the upper Swaledale sections from Keld to Reeth the following day and the final Reeth to Richmond leg on 23 September. The whole event starts at St Bees Head on 14 September and ends on at Robin Hood’s Bay on 30 September. Anyone wanting to take part should book. Details can be found on the CPRE North Yorkshire website or by ringing 01765 609167.